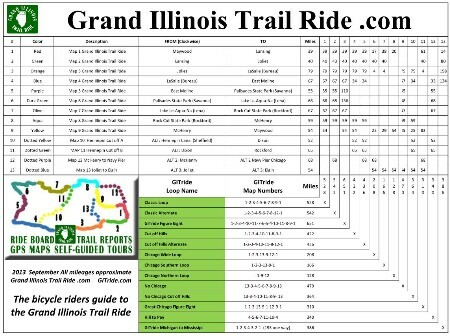 The Grand Illinois Trail Ride is an athletic bicycle tourist venue in Northern Illinois, USA. We are pleased to announce that we have completed a chart of loops that will allow an interested rider to chose which loop attempt would best suit their available time and ability, based upon terrain and mileage. The Grand Illinois Trail Ride is not one bicycle ride, it’s thirteen! The supplied graphic was designed to print on landscape on a Standard 8.5″ x 11″ page, so that interested bike shops, clubs and Grand Illinois Trail Ride supporters can easily print a hard copy and post it on their wall, or discuss it without having to sit in front of a computer or mobile screen. The chart is also currently available on the left sidebar by clicking the map graphic between the site description and the map homepages menu on every page. The Classic Loop: a loop that uses the originally designed nine sections that make up the Grand Illinois Trail Ride. The Classic Alternate: a loop that follows the classic map but avoids map nine and goes West From McHenry. It follows more of the Chicago Lakefront. The GITride Figure Eight: a double loop that follows the Classic map but crisscrosses the state at Maps 10 and 11, It’s the longest loop on the Grand Illinois Trail Ride at 651 miles. The Cut Off Hills Loop: a loop that cuts North before East Moline through Dixon to Rockford and then follows the classic loop, avoiding the difficulties in JoDavies County. The Cut Off Hills Alternate: This loop is the same as above but, drops map nine in favor of the North side Chicago map 12. Chicago Wide Loop: This map follows the Fox River on the West end and more of the Lakefront via map 12. It is the longest of the proper Chicago loops. Chicago Southern Loop: This map goes through downtown Chicago heading South, but only loops as far North as Elgin before it cuts back South on map nine. Chicago Northern Loop: The shortest of all loops at 128 miles, it completes all of map 9 through to McHenry, and West then South on Map 12. No Chicago Loop: This avoids just about everything East of the Fox River in Illinois, but still has very respectable mileage and the big hills of JoDavies County. No Chicago Cut off Hills: A very fine comfortable loop around the center of Northern Illinois. Without what? Chicago and big hills. Great Chicago Figure Eight: A crisscrossing double loop utilizing the East/West Chicago approach on map nine. Hill to Pay: The loop of the West. It runs through the Center of Northern Illinois and has the Mississippi river as its Western border. Oh, and a part of it is quite hilly. GITride Michigan to Mississippi: A double back loop that touches Lake Michigan on one end, and the Mississippi River on the other.